Unfortunately, my vision did not take into account all the care that palm trees need in order to stay looking great all year-round. I had a lot to learn about these trees, and if you’re anything like me, you might need to remind yourself of a few basics of palm trees, to make sure that you’re taking the best care possible of your gorgeous palms! I got these tips from a local tree service who helped me to get the most out of my palms when I first moved to the area, and they are great to keep in mind all throughout the year. Make sure they get enough fertilizer and water to sustain themselves. When they are young, palm trees need to water them a couple of times each week for the first few months after planting. After that, how much water they need will depend on the exact climate where you’re living. Trees will adapt to conditions like drought and harsh weather as they grow, and will require less water. Watering a couple of times per month if possible in the summer is ideal, and this does not need to be as frequent during cooler months. The soil the palms are planted in has a big impact on how great they look. If there are lots of nutrients in the top soil, your palms should be able to thrive and look healthy. It’s not a bad idea to add some fertilizer with nutrients like potassium, magnesium, sulfur, and zinc, to make sure that your palms are getting the nutrients they need to last for years. Looking out for different pests and diseases is also incredibly important. 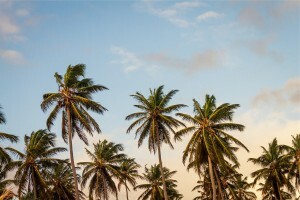 I had to familiarize myself with some common pests and diseases that can plague California palms before I knew what warning signs to look for. Thankfully, after educating myself more in the care and keeping of palm trees, I am proud to say my trees are looking healthy! My vision finally became a reality – I look out my kitchen window every morning with my cup of coffee to see palm trees out my window, and I couldn’t be happier!